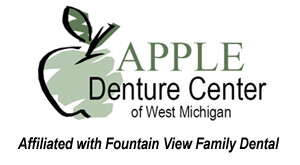 Apple Denture Center of West Michigan is Dr. Gaston's affiliated dental office that limits its range of treatment to the production of premium, high quality complete dentures, partial dentures, extractions and related surgeries necessary to make dentures. Because we are not a full service dental office, we do not need to be equipped for all of the procedures required of a full service dental office. As a result, we can make the best dentures I know how to make and offer them at economy prices!! It’s a great value for our patients. We see patients each Friday and limit this practice to 5 new patients per week. Appointments can be made Monday through Friday and emergencies can be seen on days other than Friday at my full service office, Fountain View Family Dental. Please be aware that although these are two separate dental offices, the same highly trained staff and Dr. Gaston work at each location. It’s not often when "high quality" can be equated with "economy" prices, but that’s what we do at Apple Denture Center of West Michigan. If you need a new set of dentures, or think you may need dentures, please call to set an appointment. We offer free 2nd opinions (please bring your x-rays) and we will provide you with an estimate prior to any procedures. We accept and participate with nearly all insurance companies available to West Michigan residents. Financing is also available.